The Long Gallery: Buildings Under Threat: But What Will Be The Response? Buildings Under Threat: But What Will Be The Response? ST. PAULS SUNDAY SCHOOL & PARISH HOUSE - BUILT 1880'S. Back in 1986, I was sitting in the kitchen of Elsie Snyder, a local preservationist, along with a few other people, wondering what we could do to avoid the demolition of an old historic apartment building near Akron’s Grace Park. Those gatherings, and that initial effort—which ultimately proved to be unsuccessful—led to the founding of a local group called Progress Through Preservation, (now known as the Preservation Alliance of Greater Akron) which still operates today. I bring this up for two reasons. One – more of our local historic structures are seriously threatened with demolition. And Two – I am wondering if anyone in Akron will make a concerted effort to stop it. The buildings in question are two of Akron’s most historic, and have been listed on the National Register of Historic Places for many years. 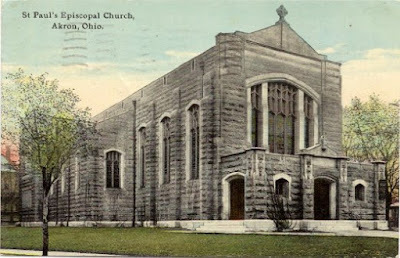 They include the former St. Paul’s Episcopal Church and adjacent Sunday School Building and Parish House, located at East Market and Forge Streets. 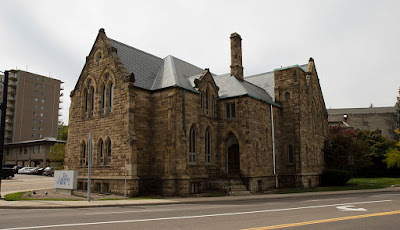 These remarkable gothic structures are among the few remaining links to 19th Century Akron, and the Sunday School is one of the better preserved examples of the historic “Akron Plan” that was developed by Lewis Miller and utilized in hundreds of church buildings across the nation up until WWI. They are attractive, generally well-preserved structures, dating from the 1880’s – 1890’s. I believe the plan is to raze them to help create some sort of “grand entrance” to the University of Akron from East Market Street; I suppose to complement a similar plan they have for a southern entrance off East Exchange Street. Needless to say, the plan—and the building’s demolition—is unnecessary and short-sighted, and wholly representative of the school’s new administration, which has alienated itself from the greater community through a number of recent missteps such as this. As to my second reason, I am waiting to see how Akron’s “preservation” community responds to this challenge. One reason I never joined the local organization was that—at least during its early years—I saw the organization as being a little too “West-Akron-centric” in its membership and attitude. I lived in a historic neighborhood on the other side of town (Goodyear Heights) and it always seemed to me that there was little interest in anything outside of Highland Square/West Hill or areas near downtown. That may have been an unfair assessment, but it was my impression at the time; also, I began working in Shaker Heights shortly thereafter, and my daily commute made it difficult to get involved in much of anything during those years. I don’t know if this is true in many other places—somehow, I suspect it is—but it seems that some preservation organizations that were active, militant and vocal about preservation during the years when they were established have devolved into “historic architecture social clubs”. These groups plan neighborhood tours, handout preservation awards and maybe talk about appreciating old houses, but no longer take an active role in promoting, planning and fighting for historic preservation. Years ago, the founders of these organizations would criticize historic groups who only looked at preservation through the concept of “historic house/building museums” – an approach based on taking a few of the very best old buildings, and preserving them in a glass case for future generations to enjoy. Thirty years ago, “real” preservationists knew that approach alone was not sufficient; they knew that preservation also meant saving neighborhoods, promoting adaptive re-use, promoting education, demanding government support, and weaving preservation into the fabric of our cities. Just this last summer, the local preservation group I’ve mentioned held a Fir Hill neighborhood tour right where these buildings are currently under threat. I wonder what they were looking at. On that street alone, two of the large houses, an 1870’s era Alumni Center and a large 1890’s era mansion (most recently a fraternity house) had been demolished over the last couple of years, leaving just a handful of buildings on the street. If this pattern continues, there won’t be much to see there in coming years. Distant tours of Detroit—which have also been on the group’s itinerary—will only have value if lessons learned in those cities are brought back to Akron and put into action. Preservation isn’t about talking to ourselves, or touring old houses with “enthusiasts” – it’s about preserving and protecting an environment, and reconnecting with our heritage. I’ve written my “Letter to The Editor” regarding the possible demolition of these historic structures—and I would happily protest any effort toward their removal. The question is, will anyone join me?